As we see 2018 coming to an end we all have a lot heading our way. The year 2019 is going to be something quite interesting for us all. Below I am going to go over some of the signs that are going to be facing the most change in the year to come. This meaning that they will be forced to adapt to a lot more than the other signs. If your sign didn’t end up making this list that does not mean you are in the clear, you can never truly know the loops this world might throw you through. You are going to be going through a lot of financial changes in your life during the course of 2019. You will be struggling with several issues in your life and love is going to be throwing you off your game big time. You are going to be forced to come to terms with something you’ve been very worried about and you might end up exhausted before everything is said and done. 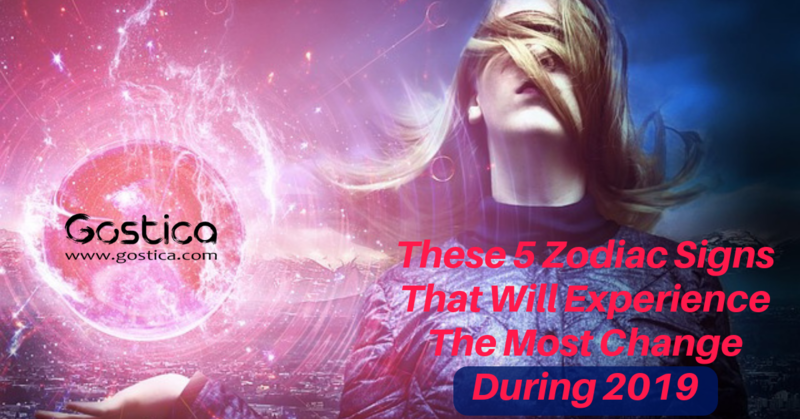 You might be finding out about something you would have never expected to happen earlier on during the year and towards the end, you should find yourself facing a chance to earn the recognition you’ve been craving. While this might not sound like much once the year begins you will be feeling these energies before you on a very deep level. While you are never one to worry about the challenges before you the year of 2019 is going to be different. You are going to be a lot luckier than you have been in the past few years. Your whole life is going to be changing and you are going to be finding yourself in a place that you actually enjoy for once. You have to remember that while some of these things to come will be uncomfortable, all of them are necessary. You are going to be so much stronger for having experienced the things to come. Once you get where you are going you are really going to be happy. Welcome the changes to come and be as realistic financially as you can be. You are going to feel like your whole life is being torn apart for a lot of 2019. Someone important to you is going to put you in a very hard position and you’re going to have to do some self-exploration. Do not let the changes to come intimidate you. You are going to end up on top of things before you know it. If you are in a relationship perhaps you need to consider your worth before the year begins. You are about to face a lot of opportunities and not all of them are going to be easy to take. Do not let yourself miss out on anything important. You’re actually going to be one of the lucky few who gets positive change rather than negative change. You are going to be finally getting the things you’ve been wanting in life. All of the hard work you’ve been putting into your life will be acknowledged. Near the beginning of the year, you will see a major set back but it is nothing you cannot handle. Overcoming the insecurities you have is going to open a lot of doors for you. You are going to be growing as a person and seeing a great deal of pay off. Stop hesitating and make your moves. You are going to be spending a lot more time listening to your inner voice in 2019 which is a good thing. Usually, you ignore the things you need to hear and hear the things most others would ignore. You are going to jump into this year with a lot of baggage but as time passes most of it is going to melt away. Do not let anyone overwhelm you, this is all happening for a reason. While it could be a bit frustrating you are going to be finally seeing the people around you for who they are and moving on from those who are using you. This year is not going to be one for risk-taking in your eyes.